A spring-tastic celebration! 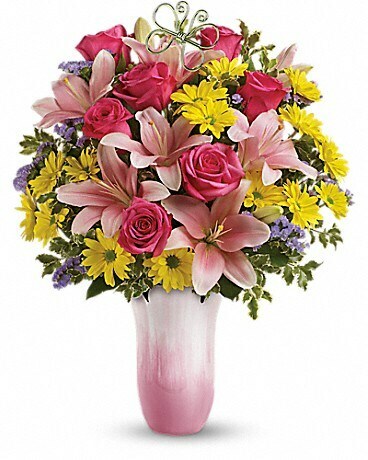 Brighten birthdays, holidays or any days with this fresh spring mix of roses, lilies and mums. 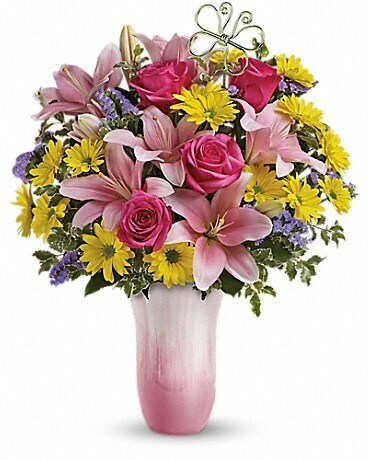 Artfully arranged in a pretty tulip-shaped vase with beautiful ombré detailing, this is a gift that will be cherished for many seasons to come! 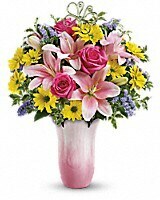 This beautiful, hand-painted, petal-shape ceramic vase is from Teleflora's exclusive Flowers-in-a-Gift collection. 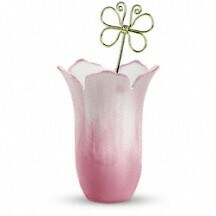 Filled with flowers or used as a décor piece, it will be a treasured keepsake for years to come. Includes a pretty butterfly pick.